Stirling Mortlock has not had the smoothest path during his Test career, waylaid on several occasions by serious injury and illness together with early doubters who rated him nothing better than a basher of a utility back with a useful goal-kicking boot. Over time though he has established his place among Australia's modern greats. During 2007 "Stirlo" became the third highest scorer in Australia Tests, and reached the 50-cap mark against South Africa in Johannesburg. A year earlier he had become the 73rd player to captain the Wallabies in a Test, and retained the captain's role (as successor to the long-serving George Gregan) into 2008. As coach Robbie Deans sought to revitalise the leadership of the Wallabies ahead of the 2009 end-of-year tour, Mortlock was stripped of the captaincy in favour of Rocky Elsom, although he retained his place in the team squad. Rewind more than a decade and in 1996 we find Mortlock representing the Australia Under-19s a year after graduating from The King's School in Paramatta, Sydney. A year later he toured Argentina with the Wallabies and also represented the Australian Under 21s and Australian Barbarians teams, but his Test debut did not arrive until 2000 against Argentina in Brisbane. He then became the fastest Australian to reach 50 and 100 Test points and capped off a memorable debut year with a last-second penalty goal from wide out to help Australia defeat South Africa in Durban and win the Tri Nations. But the fortunes of the man known as "Snork" by his ACT Brumbies team mates sank in 2001 when he missed every Test through injury. And a shoulder reconstruction at the end of the 2003 Super 12 put in doubt his participation in that year's World Cup on home soil. Considered lucky by some to make Australia's squad, Mortlock, then 26, had an up-and-down tournament which began for him with a bout of gastroenteritis. He scored a try in each of the high-scoring routs of Romania and Namibia but was omitted from the 22 who beat Ireland 17-16 in the final pool match. He returned for the quarter-final against Scotland in Brisbane, and claimed the game-breaking try from Phil Waugh's controversial turnover. Mortlock's interception try In the semi-final against deadly rivals New Zealand was crucial in knocking the All Black favourites out of their stride, and the Wallabies won before losing the final to England. Always calm and understated in his public persona, Mortlock typically described the semi-final victory as "good fun". 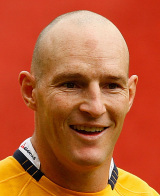 Mortlock had played all his Super Rugby for the Brumbies, winning the Super 12 title in 2001 and 2004, before agreeing a switch to the Melbourne Rebels in 2010. In 2009 he became the highest points scorer in Super Rugby history, surpassing former Crusaders fly-half Andrew Merhtens at the top of the charts. Two years later, while still with the Rebels, Mortlock confirmed his retirement from playing.